Housing Authority of Williamson County - HURST-ROSCHE, INC.
Hurst-Rosche Engineers has provided architectural design, construction, and other professional services for the Housing Authority of the County of Williamson since 1977. The Housing Authority, along with Hurst-Rosche Engineers, have completed several requirements and projects mandated by the Department of Housing and Urban Development (HUD). One of the requirements includes 504 Conversions. 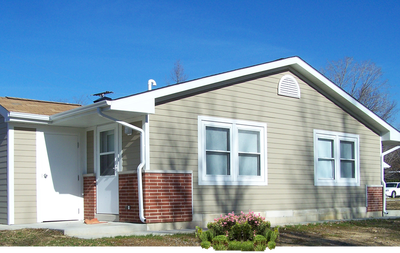 Several dwelling units within housing authority properties throughout the county were redeveloped and renovated for ADA accessibility. Along with dwelling units the sites were also improved for accessibility. Other projects funded through the Comprehensive Grant Program included lead based paint abatement, door and window replacement, and re-roofing. More dwelling unit renovations continued through the Capital Fund Program. Projects consisted of total dwelling unit renovations which included total gypsum board and floor tile asbestos abatement, installation of new kitchen cabinets, flooring, plumbing, mechanical, and electrical. Site improvements under the Capital Fund Programs consisted of site utility work including water main distribution, sanitary sewer, gas distribution, and underground electric service installation. In addition to the above mentioned projects was an expansion to their existing office located in Carterville, Il. The approximately 1,600 square foot addition included a new entry vestibule, a board room, and the new offices. New and existing construction such as brick colors and roof slopes were closely matched, making the new addition appear as if it were part of the original building.